The stories written by God end in a happy ending. I know one of them. It may have happened in this way, maybe a little differently, but the sacrifice of love and purity present in this story is solid and indisputable as the stone that stands over her grave today. According to the registry notes - hostia sanctae castitatis (the sacrifice of the holy purity) - it can be said that it was the sacrifice of a girl who knew what was right. The image of the village, similar to this behind my windows, revives in my mind. There are four girls running down the road. The plaits reach almost their waist. Anka has a dandelion wreath on her head, she holds another one carefully in her hand - for the Virgin Mary. The Heavenly Mother knows them all very well. They walk to her, singing songs – the songs of carefree children. When 10-year-old Anka loses her mom, she finds her strength in God. Sill children's hands learn to cook, wash, clean. The household under her control is never lonely. Her friends, loyal companions, neighbors and even aunts living close to her come and help her. Anka gets along with everyone. Her serious face softens in a beautiful smile when she invites her friends to a cake, whereas she tingles if it tastes good. And plaits grow like mad. Summers are passing by splashing in the river and winter days by songs and jokes in the kitchen of Kolesár family. Anka can already cook almost everything, now she is a young lady. More often we can see her standing at the well and drawing water, to wash the potatoes or to water the animals. She also sips. We can see her at the stove and also among the girls on their pilgrimage to the Virgin Mary to Klokočov. She carries a wreath made of the modest dandelions again. Simple beauty accompanies her during her pure life. The pulse of the village life - simple, but joyful - is interrupted by the burden of the war. November comes . There were so many similar to this one in the past. But the girl feels that something is going on, something is different. 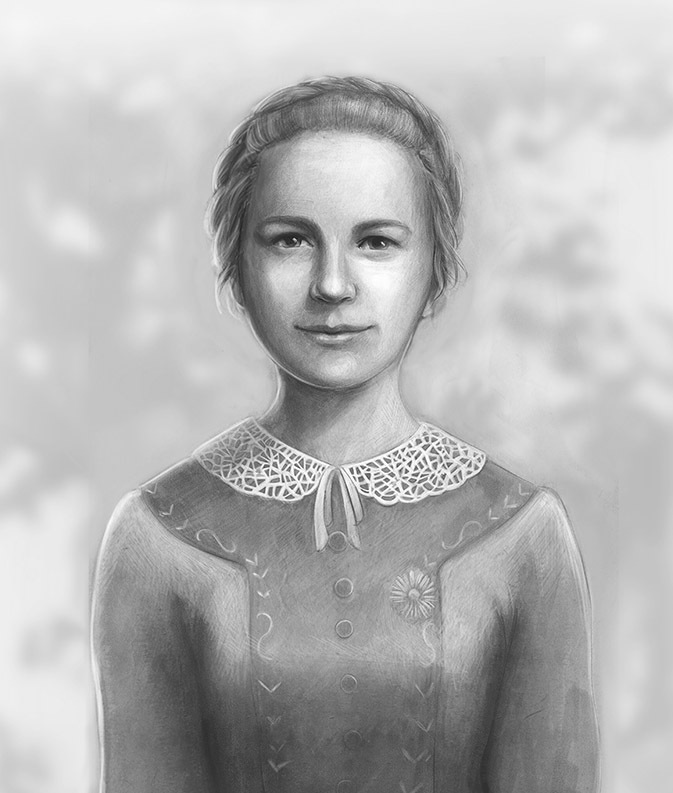 Once, a neighbor notices Anka's slim figure in the dress of her dead mother. "Why are you dressed in black, my dear?" „I'm afraid, aunt, that they will see me. Soldiers shouldn't know I am young,“ says sixteen-year-old Anka. Her plan is still working. She has trouble only with the length of her dress when she walks slowly in the queue for the Communion. Also in the evening before, she goes to church to strengthen herself by the Eucharist, perhaps without the idea that it is the last time and then she will meet her God face to face. And the girl obeys. But the good intention changes into the tragedy. The soldier realized very quickly that under the coarse dark cloth no adult person is hidden, but a young girl. Beautiful and pure. Devilish lips are whispering the worst words and the desire of a guy with the machine gun grows. „Surrender or you will be dead immediately,“ he screams and insists. The girl portrays her life in her mind, weaved by the traces of loving God. She returns to her childhood, to the years spent without mother but also to the beautiful moments at pilgrimages, in the village, among her beloved. She knows that she is loved, and the sin is something disgusting for her, so she makes an admirable decision. At this moment it seems like the time has stopped. The villagers in the neighbour cellar have no idea of what is going on. Then there are shots. First, second ... two exact wounds end a heroic earthly life. Next day, men dismantle the barn and a small coffin is made from the battens. Women prepares Anka's body into the coffin. At night, they secretly bury the martyr of the purity. Without the priest, without any ceremonies. There is no other possibility. But once it changes. Today, at the place where Anka's remains are stored, there is a stones with the inscription: RATHER DEATH THAN SIN. It is read by thousands of young people who see the ideal in her. And the story of a pure girl - shining as the sun in the sky - comes alive in them.